Military uniform jackets painted by veterans are the centerpiece of The War Experience Project, an art exhibit that opened in Tacoma on Veterans Day. When Rick Lawson returned from Balad, Iraq in 2005, the 22-year-old specialist, who had served as a laboratory technician during a yearlong deployment with the Washington National Guard's 81st Brigade, found himself having a tough transition. He had wanted to stay in the military, but was medically discharged following the deployment. He was surviving on his Veterans Affairs benefits. And in Dec., 2006, a close friend was killed by an Improvised Explosive Device in Iraq. He found himself bombarded with questions about his deployment, such as "What was it like to serve? ", "Did you ever see anyone die?" and "Did you ever kill anyone?" The questions were disturbing to Lawson, now 28. "I don't understand how someone could ask that kind of question," he said. While enrolled in a "History and Social Responsibility" humanities class at Western Washington University in 2008, Lawson was forced to face down some demons. For an assignment to create an art piece in response to the Bayeux Tapestry - an 11th century textile that depicts the Norman invasion of 1066 - Lawson drew from his own experiences in Iraq. While looking for scrap fabric and inspiration for the assignment in the Bellingham home he shared with wife Valery Tolle, an artist, Lawson stumbled across his old Army Tuff Boxes tucked away in the back of his closet. "It was the last thing I wanted to look at," he said. He found himself holding an old set of his Desert Combat Uniform (or DCU), and put it on for the first time in years. Embedded within the fabric were "all memories of my war experience," he said. "I know I could put them away and not confront the memories, or I could acknowledge them." It was then that Lawson realized he wanted to use the DCU for his project. He cut out a swatch from the back of the uniform, grabbed some finger paints, and started working. He didn't know what would happen, he said. For four hours, he was immersed in the creation of his story - and perhaps, the beginning of a rebirth of his self. "It was an intense, emotional experience," Lawson said of painting the piece. "But in the end, really cathartic." He found himself creating the scene of an explosion, to which he later added a Humvee. "It was an expression of frustration and anger," he said. "When I put my fingers on the uniform, it was intuitive. It just came back." Lawson's creation was the catalyst for The War Experience Project, an exhibit which opened at 906 Broadway in Tacoma on Veterans Day for a three-month run. The exhibit is the project's 13th showing and is sponsored by Spaceworks Tacoma, a joint initiative between the Arts Program of Tacoma, the Tacoma Chamber of Commerce and Shunpike, a non-profit Seattle art service organization. 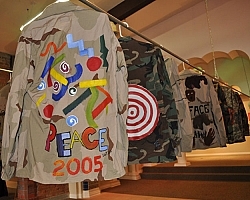 In addition to photography by Christian Hamilton and paintings by Erick Schmidt - both veterans - the project includes an exhibit entitled inFORMATION, which features about 50 veteran-designed military uniform jackets - including Lawson's - culled from art workshops held at veterans centers, colleges and art galleries. Lawson notes that not everyone who creates a piece has had a bad experience in the military or served in combat. "It's not art therapy," Lawson stresses, "It's artistic expression. And that's therapeutic." The messages painted on the backs of the jackets range from the sublime to the powerful. Some are simply hand-written messages; others contain graphic, vivid and violent scenes of war with messages ranging from "support the troops," to "F*** the US Army." The designs are elaborate and simple, colorful and drab. But all are unique. And all are compelling. Lawson envisions the project as a timeline of sorts, allowing veterans to create stories through the uniforms and "empowering those who've served (to) create a new conversation and a statement on their own terms," he said. Gallery visitors are encouraged to touch the pieces, which are hung at eye-level, "to connect with the uniform and the artist," Lawson said. "I hope they are changed by it." Looking over the display brought back memories for Susan Wagshul, who was at the exhibit on opening day with her husband, Army veteran Warren Maltbie. "It's very striking. You see their pain, anger (and) sadness, but also a lot of empowerment, especially from female vets. It's amazing." Gallery hours are Wednesdays to Saturdays, 10 a.m. to 5 p.m. and Sundays from noon to 5. Painting workshops for veterans and families will be held Nov. 18 during Tacoma's Artwalk and Nov. 20 from 11 a.m. to 3 p.m. at the gallery. Lawson is always looking for donations of used military uniforms jackets. For more information about the project or to donate, visit www.warep.com, call (347) 927-3708 or stop by the gallery at 906 Broadway in downtown Tacoma.